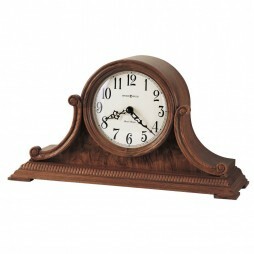 Uniquely designed to suit your stylish home interior, this Howard Miller Urban Mantel Clock offers a flat-top pediment with a nickel finished molding. Finished in Urban Casual on select hardwoods and veneers. The white dial features a nickel finished bezel with simple-styled hour markers and hands. This stylish clock flaunts the perfect blend of elegance and efficiency. With 12 months warranty, this is certainly a carefree buy. The white dial features a nickel finished bezel with simple-styled hour markers and hands. Quartz, dual-chime Kieninger movement plays full Westminster or Ave Maria chimes with strike on the hour, with optional 4/4 chime feature which plays 1/4, 1/2, and 3/4 chimes accordingly. Finished in Urban Casual on select hardwoods and veneers. Expressions of Time is an authorized Howard Miller dealer. This means you’ll receive authentic Howard Miller clock, covered by the one year manufacturer’s warranty. Still have questions about this product? 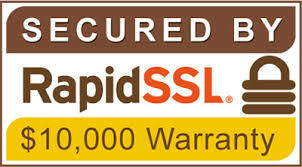 Call us at 866 467-6460 or complete the product inquiry form. Enhance the stylish appeal of your living room wall with this Howard Miller Langeland Bracket-Style Mantel Clock This stately bracket-style mantel clock features reeded columns with carved top and bottom caps, and a decorative molding at the top and bottom of the multi-tiered base. The lamb?s wool dial features Roman numerals and a polished brass bezel. This mantel his wall clock can also double up as a great gifting option. Bring some magic of florals to your room and dcor with this Howard Miller Andrea 81St Anniversary Edition Mantel Clock. 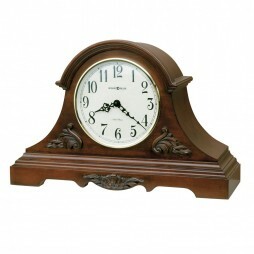 It?s a special 81st Anniversary Edition mantel clock with decorative details and includes a carved base molding, bezel and side overlays featuring a leaf pattern. The antique brushed brass pendulum swings and is viewed through a glass window framed with a carved overlay. The aged dial with special Anniversary dial offering Black Roman numerals with an aged gold carved center overlay and black serpentine hands beneath a convex glass crystal. 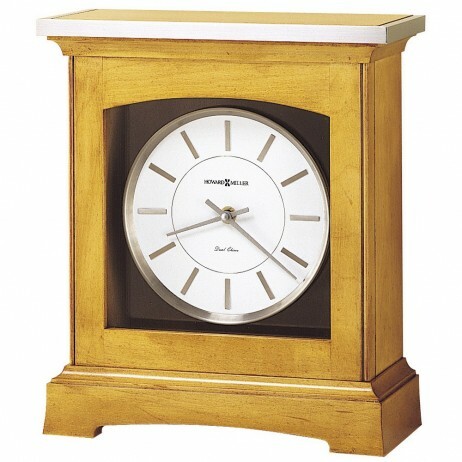 Made of high grade material, this clock is not just great on looks but also on durability. With a simple yet captivating design, this Howard Miller Sheldon Dual Chime Tambour Mantel Clock can make a lovely addition to your space. 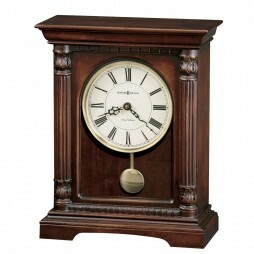 This beautiful Howard Miller mantle clock is finished in Americana Cherry on select hardwoods and veneers. 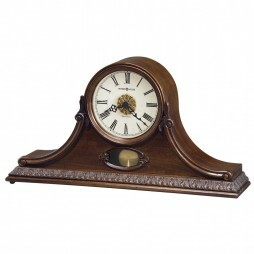 This lightly distressed mantel clock is embellished with elegant details. Carved overlays frame the tambour dial and decorate the cutout base, while an arched molding crowns the top. An off-white dial features crisp black Arabic numerals and serpentine hands. This wooden based wall clock will not only add charm but will also lend function to your space. This Howard Miller Anthony 77Th Anniversary Edition Tambour Mantel Clock can end your clock hunt with its exquisite design and simple attributes. It has a traditional essence to it that can make your living space a pristine one. It is the 77th Anniversary Edition tambour mantel clock that is rich in details. Elegantly carved side scrolls frame the dial and burl veneered front, and a wrap-around beaded dentil molding completes the picture. Under a convex glass crystal, the aged dial offers black Arabic numerals, black serpentine hour and minute hands. Finished in Windsor Cherry on select hardwoods and veneers. This is a best gifting option for your loved ones for its exemplary frame.